Lean and Six Sigma (LSS), methodologies focused on reducing waste and improving efficiency, have continued to grow throughout the commercial and government sectors. In our current environment of fiscal restraint a growing number of organizations are using LSS to streamline operations and improve efficiency in businesses ranging from insurance to IT to hospital services. Lean and Six Sigma are more than methodologies; they are a mindset that can be used to cut costs while ensuring value and substance to your customers. Understandably, Research and development are rich in Quality Control and statistical rigor. However, LSS brings that same level of Quality Control and Statistical Rigor to the non-experimental/developmental processes allowing your organization to better utilize its resources while allowing its key personnel to focus on finding the next great thing. One of the most recent developments in the world of Lean and Six Sigma is the use of the methodologies in the world of research and development (R&D). R&D is not limited to medical and scientific fields; it is an integral part of an organization’s development and growth. Developing new services and products for the consumer is how organizations continue to move forward and grow within their sector and against their competition. Quite often a new product will fail to meet the expectations of the consumer because there was not enough time spent on R&D even though the financial outlay on the R&D has been substantial. To be successful, a organization needs to reevaluate how they are performing research and development to make it useful and reduce failure. However, R&D is not the only thing an organization must consider in order to stay alive in today’s competitive market. They need to also be diverse and innovative. When combined with research and development, diversity and innovation help set an organization apart from the rest. It is what allows them to improve on current products to make them better and more appealing to the consumer. An organization will never produce a perfect product, but a product produced with the right mix of R&D, diversity and innovation will make one that is wanted by the consumer. Innovation is key to the growth of an organization. It allows them to look at the current marketplace and determine what is needed in order to attract the consumer and ensure brand loyalty. If an organization’s R&D department cannot remain innovative, then the organization will not be able to prosper, remain liquid, and expand. If the company is failing in producing products that are attractive to the consumer and bringing in a profit, it is time for them to re-evaluate how they are performing research and take steps to redefine their methodology. R&D for any organization can be a risky undertaking. Developing a new product – or even improving on an existing product – requires attention to detail and a level of understanding of what the consumer wants and what the competition is doing. Time and resources involved in R&D can be costly when it comes to researching innovative new products and improvements to old. There will be defects within an organization’s R&D process, even if management does not recognize the defects for what they are. Lean and Six Sigma can help reduce the risk and defects within an organization’s R&D process, making it more manageable, less costly, and more reliable. When you integrate Lean and Six Sigma methodologies into your research and development, you will change the way you conduct the research. Gathering the “Voice of the Customer” in order to shape your decision making regarding the product or service in question is one of the key factors that make Lean and Six Sigma work. For example, when trying to streamline the triage process in a hospital ER, the hospital’s R&D department gathered information from ER personnel and hospital patients about how the current method was working, how long it took from arrival to discharge, and how patients were evaluated in order to use six sigma to develop a better method. By performing due diligence and starting the R&D process with information from your customer, you can start to develop a better product of service. Step 1: Gather information using surveys and customer comments about what the consumer is looking for in the product. This will help you understand not only what they are looking for, but also what they do and don’t like about the product. Understanding what they like is just as important as knowing what they want from the product so that you can improve it. Step 2: Look at your existing product line and identify whether or not any of the items you currently produce can be used in the marketplace to meet consumer wants that are currently not being met. This is a good time to also do a competitive analysis of your competition so you can diversify your own product line to compete with theirs. Step 3: Review each of the most lucrative market opportunities available to you and determine which ones would work the best with your current product line and branding. Consider all of the characteristics of your products when reviewing the opportunities. There may be opportunity here to diversify your current line and improve on a product that is not being utilized to fill this gap. Step 4: If you are developing a new product to fill these opportunities, field test it with a prototype and a select group of customers. This will provide you with valuable information on what they liked, didn’t like, would change, and so forth. This information can then be used to move forward to the next step or to start at the beginning of the R&D process prior to spending money on production. Step 5: Produce the product on a commercial scale and market it. Instituting Lean and Six Sigma into your organization requires training and investment in order to be able to use it wisely and effectively. However, it will allow multiple areas within your organization smoothly and in tandem while the value and substance you are trying to maintain. Anonymous. (2011, July 1). Improved Research And Development With Six Sigma And Lean Manufacturing [Web log post]. Six Sigma approach can help improve treatment process in ER: Research. (2010, August 25). Six Sigma Training Assistant. (2011, February 8). Six Sigma and its use in Research & Development Web log post]. For Thousands of years people have been making improvements to processes by utilizing more efficient methods and reducing waste. 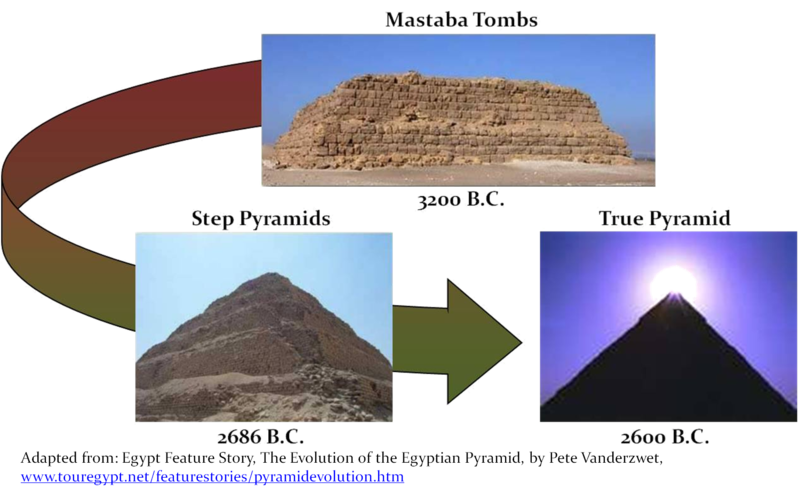 The image below shows how over time civilizations were able to build bigger and seemingly better pyramids. We could also discuss the transition from the Ox Path to the Super Highway or any number of multi-century transformations. The bottom line is if you are looking to cut through all of the clutter and confusion, rely on your organizations goals and the strengths of your people by applying some Common Sense first. – Why do we exist/what do we do/what are our goals? – What do our customer’s expect from us? – Is everything that we do geared toward meeting our customer’s needs? – Are there things we can stop doing and still meet our goals? – Why are we doing things the way that we do them? – Can we do what we do better? Once your organization is free from clutter and confusion and activities are aligned with your Organizations Mission and Goals. Your staff should be incentivized to identify new and better ways of doing business. I know that have left a lot of information out of this post. We have gone through some of the tools that can be used in previous posts and we will introduce more tools as time goes on. The whole point of the common sense approach though is to do what makes sense and don’t be affraid to ask questions or admit that you don’t know everything.